This blog is a follow up to an Instagram post I wrote highlighting the difficulties I was having during our latest forest fire season. This August, the valley I live in (Okanagan Valley) was draped in heavy smoke. Our Air Quality got as high as 404 which, just for context, is roughly 200+ worse than countries like China and India. It was heavy. Literally. My allergies flared, my sinuses closed shut and my eyes were burning like mad. It took me a few days, but eventually, I busted out my 5 personal favorite essential oils for breathing and WOW, what a difference it made. …until I have my own profound experience with them. Within hours of diffusing the blend I’m about to share my sinuses opened and my allergic reaction (hay fever type stuff like watery eyes and sneezing mostly) had stopped. It was a DUH moment, I work with herbs and oils every day, this should have been one of the first things I did when the smoke rolled in. A few days later I upped the game even more and made a respiratory salve to help keep my lungs and sinuses open. According to Chinese Medicine, the Lungs naturally want to be open and clear, like empty space. I’ve heard some people talk about doing a Lung detox after the smoke, and I understand the thinking behind this, but the Lungs are different than the Liver and Kidneys in the sense that their essential state is to be open, whereas the Liver and Kidneys are a bit denser and they filter out toxins in a different way. So, to “detox” the Lungs we want to open them up, as opposed to purge them of toxic build up. It may seem that I am splitting hairs, but it’s important to understand the difference so we can tune into the functions and consciousness of the organs. Pungent oils that open the airway are the best essential oils for breathing. Here’s the blend I did and some benefits to each oil. Thyme Essential Oil – In my opinion, this oil is underrated when it comes to the respiratory system. It’s highly antioxidant so it’s great at removing highly oxidized and potentially harmful agents that we breathe. According to Traditional Chinese Medicine (TCM) it helps to clear heat from the Lungs. “Heat” is often – not always – related to infection which supports the known western functions of it being quite anti-bacterial, viral and fungal. Read more on the health benefits of Thyme Essential Oil. Frankincense Essential Oil – This one could and does have a plethora of websites and blogs dedicated solely to its health benefits. I consider it a Master oil, meaning that it has a lot of influence in the body and a strong and profound effect. TCM says it helps promote the circulation of Lung Qi (energy), helps with breathing and helps cool Lung Heat. We know that it is widely used for cellular regeneration as well. View a more detailed TCM and western look at the health benefits of Frankincense Essential Oil. I also like Dr. Axes write up on it here. Cypress Essential Oil – A definite favorite, cypress is spicy and pine like, so it moves the Qi (energy) dynamic outward. It opens up the Lungs and the sinuses. It also helps to break up phlegm congestion and is supportive to the other oils in the blend. It is known to be antibacterial and helps treat Lung infections. Here is a study that was published showing its antibacterial properties and here’s a more detailed look at the benefits of Cypress oil. Eucalyptus Essential Oil – Eucalyptus Essential Oil is a no-brainer when it comes to respiratory concerns. 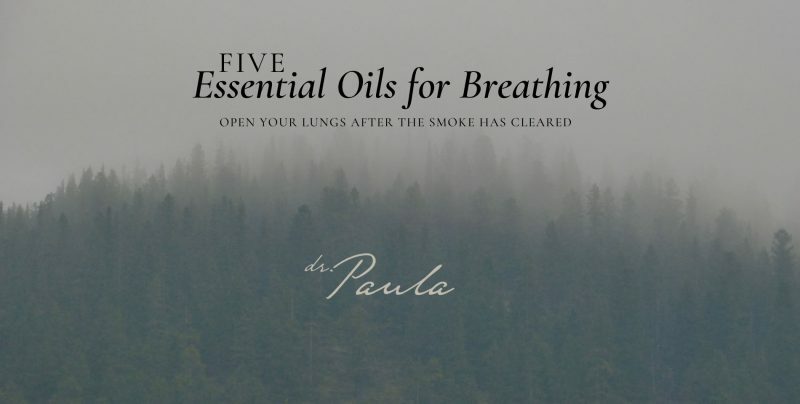 It is one of the best essential oils for breathing. In this blend, I used Eucalyptus Radiata, which, according to TCM, is more for heat in the Lungs. Again, that could be thought of as being more infectious nature. Whereas Eucalyptus Globulus is more for cold Lung disorders, where you might find more constriction in the chest and coughing. Here’s a link to 18 benefits of Eucalyptus oil and if you’d like to know more from a TCM perspective here’s a link to my post about the benefits of Eucalyptus Oil. Peppermint Essential Oil – Another common, insanely powerful, multifaceted oil that is highly regarded as being a first-class essential oils for breathing is peppermint. This oil is spicy, cooling and also super refreshing. It really cleaned up the air quality in my office and house during the smoke. It is also wonderful for headaches and fatigue, both of which are a common side effect of too much smoke inhalation. Be mindful if you are someone who experiences heart palpitation or a lot of anxiety at sometimes it can exacerbate these symptoms as it has a strong upward motion – hence why it is uplifting. Here’s more on the TCM qualities and health benefits of Peppermint Essential Oil. Start with equal parts of each and then add more of one oil or another according to your symptoms and or smell preference. I heavied up on the Eucalyptus and the Cypress for a stronger sinus opening and heat reducing effect. If you have any questions please reach out, I love talking about this stuff! All day, all night. And if you are interested in learning more about Chinese Medicine, Acupuncture and how Essential Oils work within this paradigm I offer a 6-week course on just this.